SALT LAKE CITY (AP) Rookie Donovan Mitchell couldn’t hold back a wide, toothy smile as Utah Jazz fans chanted his name and gave an ovation that lasted for minutes after a win over the New Orleans Pelicans. 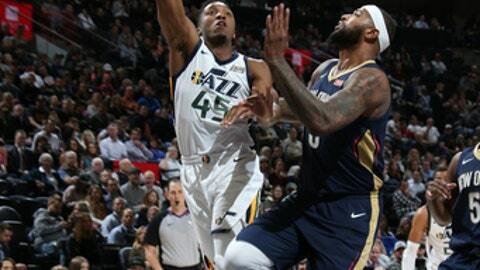 Mitchell scored a career-high 41 points and powered the Jazz’s fourth-quarter rally in a 114-108 victory over the New Orleans Pelicans on Friday night. The No. 13 overall draft pick set the Jazz scoring record for a rookie and became the first NBA rookie to score 40 points in a game since Blake Griffin in 2011. He surpassed Darrell Griffith’s team-record 38 in 1981. ”I don’t have any words, to be honest,” Mitchell said. ”I had Jonas (Jerebko) in my ear saying keep taking those shots. Even shots that may not always be good shots, he says keep being aggressive. Coach’s saying it. Everybody’s saying it. New Orleans star Anthony Davis went down with a left groin injury at the beginning of the fourth quarter, hitting the ground under the Jazz basket and laying there until trainers came to help. Coach Alvin Gentry said Davis will have an MRI in Portland on Saturday and is ”very unlikely” to play. They eventually carried the All-Star off because he couldn’t put any pressure on one of his legs. He was immediately placed in a wheelchair and taken to the training room. Davis had 19 points and 10 rebounds before leaving. DeMarcus Cousins led New Orleans with 23 points and 13 rebounds. ”They hit some shots, they hit some big shots,” Cousins said. ”The rookie had a (heck) of a game, he dominated from start to finish. They hit some big shots. Jazz: Rodney Hood missed his third consecutive game with left ankle soreness. … Raul Neto did not play for the second straight game due to left hamstring soreness.